When predators arrive such as Raccoons, Storks or Herons, they commonly feed on the inhabitants in your fish pond. 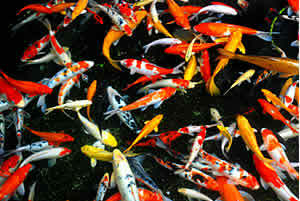 Koi and other fish can be very expensive to replace. Crawfish farms are another victim of predatory birds and mammals. There are ways to protect your expensive fish. Many of these are family pets and to have predators come in and kill them is unfathomable. Our Wildlife Experts will remove the source of the predation, offer protective measures to keep future losses at a minimum and provide re-stocking of your fish pond. Contact us today for an evaluation of your fish pond and stocking and management.